While everyone in the fitness industry is going on about the importance of macronutrients for athletes of all fitness levels, no enough love and praise is given to the vitamins and minerals that enable healthy processes in your body in the first place. Without them, your nutrition and workout regime wouldn’t be able to grant you the fat-burning results or the strength gain you’re striving to achieve. The micronutrient we’ll be focusing on today is magnesium, a powerful mineral that boasts many a vital property for mental health and overall well-being, as well as athletic performance. Whether your goal is to burn fat, build muscle, or add PRs to your main lifts, magnesium will have a vital role to play in your long-term success. Here are the five reasons why you should emphasize magnesium intake any way you can. Your nervous system regulates everything from inflammation and adaptation following a workout, all the way to strength gain and the level of progress you can achieve every single time you push your limits in the gym. 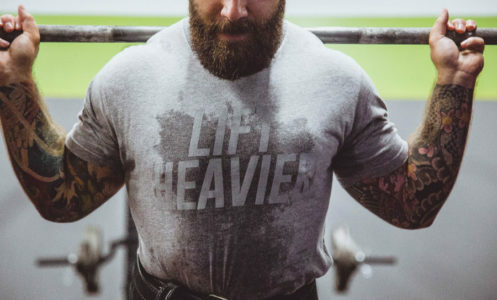 If you’re into strength training, then you should know just how taxing lifting heavy weights can be on your CNS, and how debilitating a nervous system breakdown can be – depending on your magnesium intake, you might be able to get back in the gym after a couple of days, or you might require a whole week off of training. Magnesium is one of the minerals that is responsible for recovery and nervous system repair following a tough workout, and consuming enough through a healthy diet will allow you come back to the gym stronger than before. Strive for no less than 400mg of magnesium a day. While calcium is the leading micronutrient responsible for mineral bone strength and density, there are numerous other vital components that make strong joints, bones, and connective tissue. Aside from vitamin D, magnesium is a powerful bone-strengthener, as it facilitates proper calcium absorption in the body. Remember, calcium cannot work alone, it needs complementary minerals and vitamins to properly enter the cell, and help your bones become strong and dense. You can complement calcium-rich foods with magnesium foods such as pumpkin seeds, almonds, legumes, seafood, and green leafy vegetables, however do keep in mind that magnesium is difficult to consume through diet alone. Due to its poor availability from foods, adequate supplementation for athletes is needed. Some of the most notable benefits of supplementary magnesium tablets include increased energy production, and better muscle protein synthesis – arguably the most important for growth and progress in and out of the gym. Aiding the transportation of chemical energy within cells, magnesium is one of the crucial elements of proper ATP (adenosine triphosphate) production in the body during exercise. Moreover, magnesium is one of the most important elements that preserve the structural integrity of proteins in your body. Not only is this mineral crucial for protein preservation, but also protein production, as it boosts muscle-protein synthesis after a workout by working in synergy with other micro and macronutrients. Ask any experienced athlete and they will tell you just how important proper sleep is for athletic performance, power output, strength, and mental health. As a fitness aficionado, you need to stick to a strict sleeping schedule that will allow your entire body to rest and recover in order to prepare your for the workouts ahead. As a natural relaxant, magnesium can improve your sleep cycles by binding to the GABA neurotransmitter responsible for restoring a deep sense of calm within the body. Athletes who fail to take enough magnesium on a daily basis can suffer from insomnia, restlessness, and excessive inflammation, all of which will hinder your ability to grow muscle and strength in the long run. But that’s only the beginning. Studies have shown that people who are deficient in magnesium can suffer from a wide array of psychological disorders, including anxiety, depression, stress, irritability, and aggression. Of all the micronutrients essential for post-workout recovery, magnesium has the ability to minimize total-body inflammation following a rigorous workout, and help the nervous system recover while preserving the strength and resilience of your immune system. This is especially important for athletes looking to stay consistent with their training and are looking for ways to stay illness-free for the duration of their competition prep. Supplementing with magnesium will allow the inflamed muscle tissue to relax, and the blood flow to resume its normal course through the body. One of the biggest problems athletes face is hindered blood flow in the contracted areas, which produces excess muscle soreness and cramps, ultimately leading to subpar performance in the gym. With magnesium, you can recover properly and prepare your body for another successful training session. Athletes of all levels of experience and expertise should emphasize proper nutrition that includes macronutrient and micronutrient intake on a daily basis if they are to reach their long-term fitness goals. Magnesium in particular should hold a special place in your routine, and a special spot on your supplement shelf. I am a weightlifter. For many days I’ve been using various proteins for a lot of energy. but i have no idea how many effective MAGNESIUM for the lifter. thank you for amazing tips. its very suitable for me. I never knew magnesium had so many benefits for a lifter. Thanks for sharing this article!